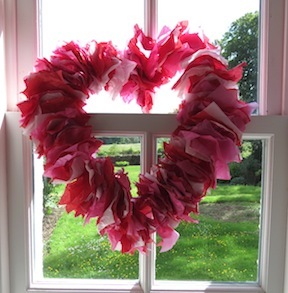 So, when I was experimenting with valentines crafts I made this beautiful tissue heart-shaped wreath. 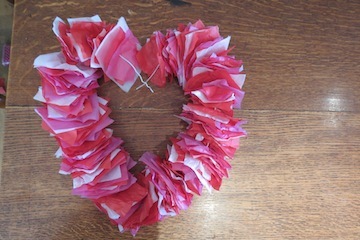 Wow I thought, what a great project for slightly older children to make around valentines day! 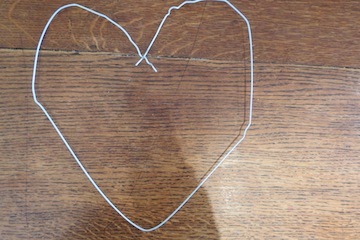 Your children might need some help to start by making the heart shape from a clothes-hanger, but otherwise it's so quick and easy! 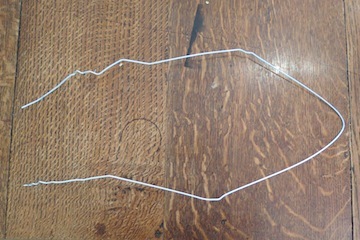 One metal coat-hanger (make sure the hook is not welded but twisted). 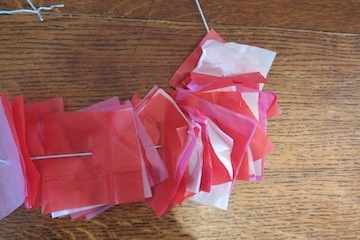 At least 15 sheets of pink, red and white tissue paper, plain or patterned. 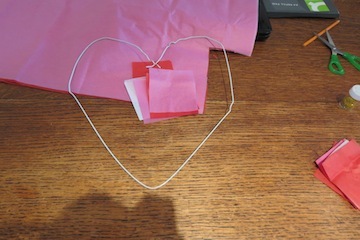 One piece of valentine coloured ribbon (approx. 20cm). 1. You will need an adult to help with this first bit as its quite tough! 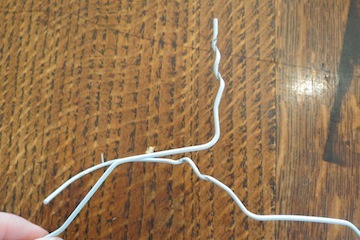 Take a metal, twisted coat-hanger and loosen the hook at the top by twisting it. 2. 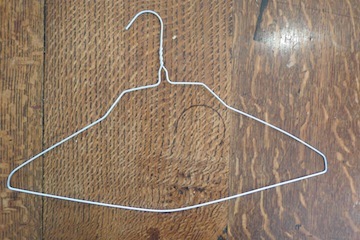 Untwist the hook on the coat-hanger completely and straighten the metal out. 3. 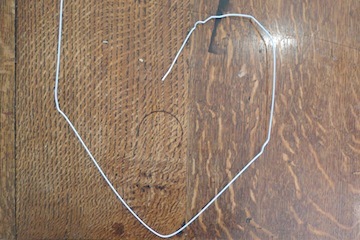 Make the middle-bottom of the hanger the point of the heart, and start to bend it into a heart shape. 4. Make one curve of the heart first, followed by the other. 5. OK. Now its much easier! You have the base of your heart-shaped wreath. 6. 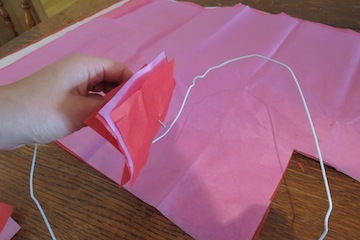 Place all the sheets of tissue paper on top of one another and cut out lots of square bundles approx. 3x3 inches. 7. Take the first bundle of tissue and push one end of the metal through the middle of the paper. Continue! 8. As you go push the bundles along the wire. 9. Once you have 4-5 bundles on the wire, stop for a moment and scrunch the leaves up with your hands to bulk them out. 10. Keep adding paper bundles. 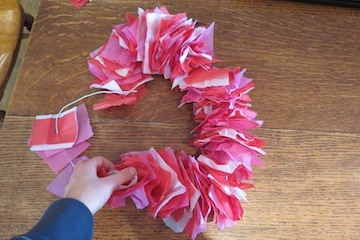 You need a lot of pieces of tissue to bulk out the wreath. Also, make sure you keep scrunching the tissue up a bit too - not too hard, but just enough to bulk it out. 11. Now you have a full wreath of paper. 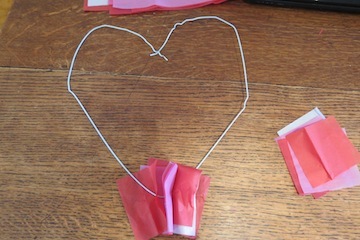 Using sticky-tape bind the heart ends together well and ruffle some paper over them so you don't see the point. If you like you can wind some ribbon round the tape so you don't see it at all. Voila! 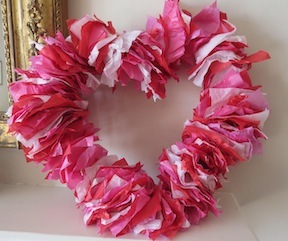 Your beautiful valentines wreath ready to decorate your home!